Age restrictions: Child age 3 – 15. Children under 16 years old MUST be accompanied by an adult (18+)Children under 3 years old go FREE but will require a ticket, please ensure that this is requested when booking. 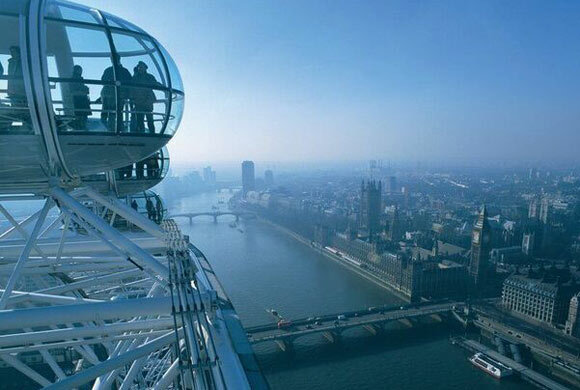 Opening hours: London Eye open daily: 11am - 6pm. River Cruise Schedule: 11:45am, 12:45pm, 1:45pm, 2:45pm, 3:45pm & 4:45pm (last departure). Pick up point: On arrival present your voucher to the operator at the pre-paid ticket desk.You will then be issued with two separate tickets, one for the London Eye and another for the River cruise. Important info: Audio commentary is available in French, Spanish, German, Dutch, Italian, Russian, Japanese and Mandarin. T-loops system is also available.The River Cruise is closed for annual maintenance from 2nd January 2019 until 22nd January 2019. Combing two of the most impressive views in London from the River Thames to 135 metres in the air on the Coca Cola London Eye you can be assured of getting the view of many landmarks including St Pauls Cathedral, the houses of Parliament, Tower Bridge and the Tower of London. During the 30 minute rotation of the Eye visitors can take in the sights whilst multimedia displays will explain the history behind these attractions. Follow this with a 40 minute boat ride along the Thames where you will be able to get a closer view of these iconic structures from a perspective only available on this tour. Both elements of this break have multi lingual information available whilst the Thames cruises are hosted by knowledgeable guides who will point out the sights and explain the history behind them. With a Fast track ticket as part of your Hotel Direct Sightseeing break you can avoid the queues and make the most of your time in London. The London Eye was erected in 1999 and opened to the general public in 2000 and was the crowning glory of London's celebrations for the dawning of the new Millennium. Originally planned as a temporary structure, in 2005 Ken Livingstone, then London Major vowed that the landmark would remain in London. The London Eye is Europe's tallest Ferris wheel and was the highest public viewing point in London until 2013 when it was surpassed by the View from the Shard. It is illegal to die in Westminster Palace otherwise known as the Houses of Parliament. More than half of the London Underground network in fact runs above ground.